I was the lucky recipient of a $300 Superior Threads Shopping Spree for Thread Artistry in our recent fiber art and quilt show (for "When Worlds Collide"). What a neat problem to solve--where to store more of my favorite thread!! 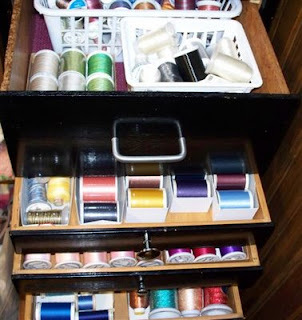 This involved rearrangement in my homemade spool cabinet to get my treasures in a more usable, visible location nearer the sewing machine. I have another storage area for more thread, but Superior's Rainbows and Nature and Living polys and King Tut cottons are my favorites and deserved a better display. 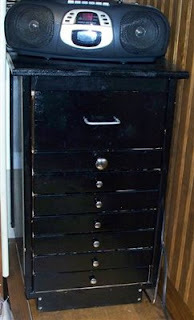 The black cabinet sits on a storage cabinet that extends across the wall (think of a window seat but no windows on this wall). I actually use this seat as my sewing chair and have the drawers easily accessible on my right. Current threads for a project can sit on the seat beside me until they are replaced in their drawer. After unwrapping a new spool, I use strips of Hugo's Amazing Tape to keep the thread from unwinding. It grabs to itself without any stickiness and can be used over and over. I cut it from the roll with pinking shears, so the pointy ends make it easy to find on the tape roll and on the spool.